Interfaith Family Month is an opportunity for your synagogue or organization to join with other welcoming communities in a bold statement that we will continue to build an inclusive Jewish community in our local areas and across the country. In 2014, over 150 synagogues and organizations in Boston, Chicago, Cleveland, Philadelphia, and the San Francisco Bay Area participated in this exciting program. This year, InterfaithFamily is expanding this program to Atlanta, Los Angeles, and the District of Columbia. You can see who is participating this year here. Interfaith Family Month is your opportunity to show that you welcome interfaith families and to thank them for their contributions to the Jewish community. In the month of November, take some time during an existing service or program to offer a blessing or words of thanks to your interfaith participants, or you may choose to offer a special program, dinner or event. Visit our resource page and FAQ for sample blessings, readings, or other program ideas. Please register your organization to be included in printed publicity. 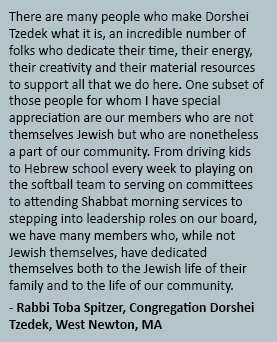 In the past, we have called this time of appreciation and gratitude for the interfaith couples and families in our communities “InterfaithFamily Shabbat.” Because of the overall enthusiasm and positive response we had to our 2014 expansion, we have changed the name to reflect this month-long celebration.